Daw Aung San Suu Kyi in Australia for five-day visit,criticised Burma’s current constitution as being “undemocratic” and urged the international community to put added pressure on Burma’s government to undergo further reforms. Speaking at the Sydney Opera House on the 27th of November, where Ms Suu Kyi received honorary degrees from both the University of Sydney and the University of Technology (Sydney). In her speech Ms Suu Kyi emphasised national “unity” as a key plank of Burma’s future political roadmap. She also said that the 2008 constitution was worded to prevent her from becoming president of the country. “This constitution was written specifically to prevent me from becoming president. I object to this… no constitution should be written with one person in mind,” she said. Ms Suu Kyi was referring to clauses in Burma’s 2008 Constitution that states that the President cannot have been married to a foreigner and the President needs to have had military experience – Ms Suu Kyi is barred from the Presidency on both counts. 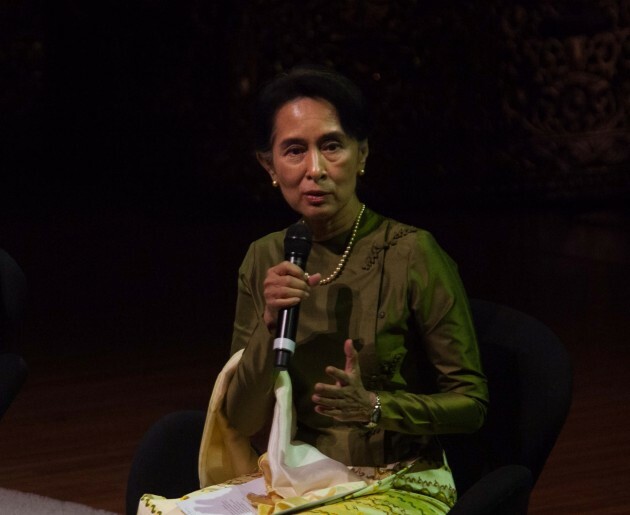 Ms Suu Kyi spoke at the Sydney Opera House ceremony in front of an audience that included people from the Burmese community – ethnic Karen, Shan, Mon and many others – the Australian ambassador in Burma, and Australian politicians. It was also reported in local media that Australia’s Kachin community boycotted the event in protest to the government’s ongoing prosecution of a vicious war in Kachin State, Burma, against the Kachin Independence Organisation (KIO) and Ms Suu Kyi’s failure to condemn the government. A band performed traditional Burmese music for the audience before the speeches began. Daw Aung San Suu Kyi was careful to avoid directly answering questions on human rights issues in Burma, specifically the persecution of Rohingya Muslims. She emphasized that lack of rule of law in Burma and a practically non-existent judiciary meant that it was no surprise that such tensions could occur in the streets and not be “resolved” in a court of law. Ms Suu Kyi said that, while often viewed as a pro-democracy campaigner, she was at heart a politician whose goal was to become Burma’s president through democratic means. “I look upon myself as a politician, not as an icon,” she said. Ms Suu Kyi emphasize to those commentators that they should spend time reading the country’s constitution to get a clear picture on why Burma still had a long way to go. “If you want to know why you are mistaken, you only have to study the Burmese constitution, not a pleasant task I can tell you. But if you read it carefully, you will understand why we cannot have genuine democracy under such a constitution,” she added.